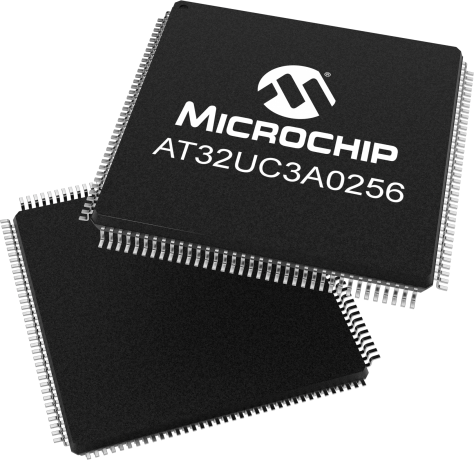 The high-performance, low-power 32-bit AVR RISC-based microcontroller combines 256KB flash, 64KB SRAM, 10/100 ethernet MAC, full-speed (12 Mbps) USB 2.0 with embedded host capability, I2S, and a built-in audio D/A converter. This device features SRAM/SDRAM external bus interface and achieves 91 Dhrystone MIPS (DMIPS) at 66MHz while consuming only 40mA at 3.3V. The Peripheral Direct Memory Access (PDCA) controller transfers data between peripherals and memories without processor involvement, drastically reducing processing with continuous large data streams within the MCU. The AT32UC3A0256AU is the Audio version of the AT32UC3A0256. It allows the execution of Microchip licensed Audio firmware IPs. AT32UC3A0256AU-ALUT: LQFP144, industrial (-40°C to +85°C), tray conditioning.